April Williams knew the risk she ran last November, when she joined two co-workers in a one-day strike for higher wages, full-time scheduling and a voice on the job. But Williams, a single mother who lives with her sister and relies on public assistance to make ends meet, said she’d rather face those risks than remain silent any longer. “Living like this is not working for me,” she said. 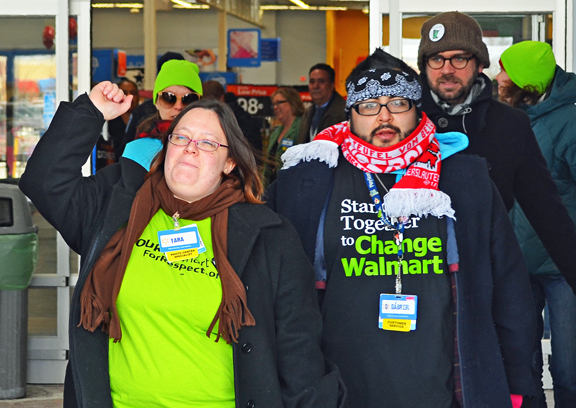 Walmart fired Williams earlier this month, but yesterday she vowed to keep fighting. Fortunately for Williams, she’s not in that fight alone. More than 100 supporters, including several single mothers, marched to the Brooklyn Center store yesterday, where they called on management to reinstate Williams, pay higher wages and enact family-friendly scheduling policies that empower single moms like Williams to lift themselves out of poverty. OUR Walmart members Cantaré Davunt and Gabe Teneyuque exit the Brooklyn Center Walmart after delivering a letter in support of fired associate April Williams. Two Walmart associates active in OUR Walmart, the non-union organizing group behind the recent wave of unfair-labor-practice strikes and protests across the country, delivered a petition and letter supporting Williams to management at the Brooklyn Center store. “I was raised in a military family, and I learned we need to speak up for those who aren’t able to speak for themselves,” said Cantaré Davunt of Duluth, who has worked at Walmart for nearly five years. 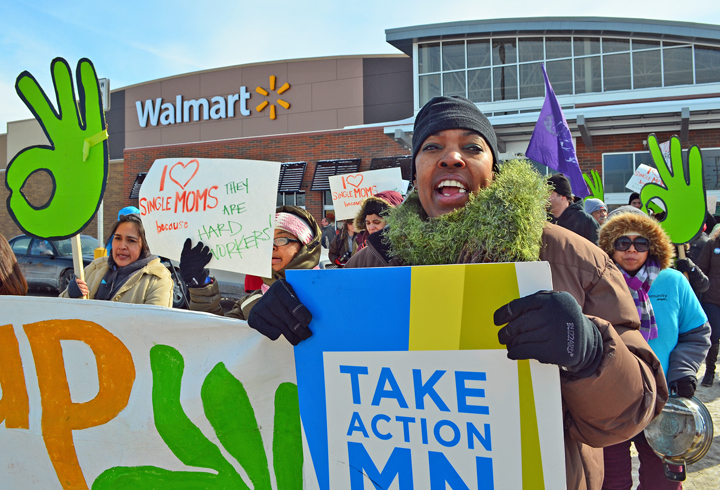 OUR Walmart organized the demonstration with TakeAction Minnesota as part of a week of action targeting low-wage employers – and highlighting the importance of raising Minnesota’s minimum wage. Wealthy corporations like Walmart have a responsibility to pay their workers higher hourly wages and to create flexible scheduling for store associates working to balance work and family life, demonstrators said. Jacquita Berens, a single mother of three and a full-time student, is not a Walmart employee, but she joined the demonstration to support friends and family members who work minimum-wage jobs at Walmart. Berens delivered a letter from TakeAction Minnesota calling on Walmart to help solve Minnesota’s low-wage work crisis by publicly supporting a bill that would raise the state’s minimum wage to $9.50 per hour by 2015 and index the wage to adjust for inflation. In Minnesota, seven out of ten minimum wage workers are women, and many are single mothers struggling to provide for themselves and their families. Don’t Shop at WalMatr. Take all your buisness to their competators so the competators will hire the WalMart refugees that WalMart fires. Simple Economics. WalMart needs customers and hard working employees to survive and we hold the power in our wallets to make this happen.